Property is property, and using copyrighted material without permission is no different from the Artful Dodger picking a pocket. Well, that isn’t quite true. Many people who “borrow” copyrighted material do so because they believe a copyright fallacy and don’t know their use is wrong. But in the law, ignorance is no excuse. That’s why I’m using this month’s blog post to bust a few of those fallacies. They cover pictures, music, poetry, and song lyrics as well as books and blog posts and other prose texts. Here are some of the most common fallacies. Anything on the Internet is fair game. There are four basic types of materials on the Internet. Materials that are in the public domain. More about this below. It doesn’t have a copyright notice, so it isn’t copyrighted. All works are copyrighted the minute they are put in tangible form, which includes the digital formats used on the Internet. A copyright notice is just a reminder. Material that doesn’t have one is still protected by the copyright laws. “Royalty free” means you don’t have to pay a royalty every time you use the material. But you do have to pay a one-time license fee, and you can use the material only under the conditions described in the license. If you use royalty free materials without paying the license fee, you have violated the copyright. Since it’s short, I can use the whole thing. The opposite is true. As a general rule, you can use only a small percentage of any work, so the shorter a piece is, the fewer words you can copy. If a passage is a miniscule percentage of the whole but is the heart of the work, however, even that may violate the copyright. This rule is also discussed in my July 25, 2013 post. So what can you use? There are four basic categories. You have permission from the copyright owner, which includes paying a license fee for royalty free materials. It's a fair use under the lawbut you are responsible for determining if it is a fair use, and there can be serious consequences if you are wrong. But what materials are in the public domain? I addressed that earlier this year but will repeat it here for your convenience. Older works for which the copyright has expired. This is mostly material that was published in the United States before 1923. Works that were created or first published in another country may have a longer copyright in those countries, so you may have to be careful about distribution. Some material published after 1923 is also in the public domain, but that is more complicated to figure out. As Christian writers, we honor God by honoring the copyright laws. But you can’t do that if you don’t know what they are. 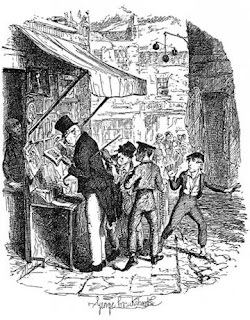 * The picture at the head of this post shows the Artful Dodger picking a pocket while Oliver Twist looks on. 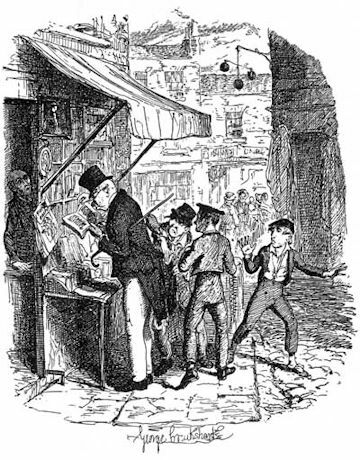 The drawing is one of the illustrations that George Cruikshank created from 1837 through 1839 for the serial version of Charles Dickens’ Oliver Twist. The picture is in the public domain because of its age. Kathryn Page Camp is a licensed attorney and full-time writer. Her most recent book, Writers in Wonderland: Keeping Your Words Legal (KP/PK Publishing 2013), is a Kirkus’ Indie Books of the Month Selection. The second edition of Kathryn’s first book, In God We Trust: How the Supreme Court’s First Amendment Decisions Affect Organized Religion, will be coming out at the beginning of October. 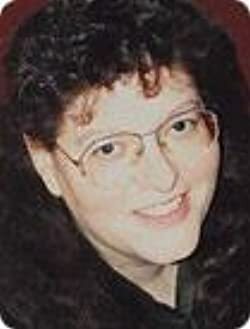 You can learn more about Kathryn at www.kathrynpagecamp.com. “What do you do?” One of the most dreaded questions among writers who don’t, or can’t, write “full-time” as they would like. Well, I do quite a lot. I read the passage above one Sunday morning before church. And while I appreciated what she said, it didn’t satisfy me – my meal was missing the dessert. He nipped my mini-rant in the bud tout de suite. Not more than 2 hours later at church we sang a song called “Blameless” by Dara Maclean. If you’ve never heard it before, you can Google the title and listen to it on YouTube. I hope you will take a couple of minutes to listen to the song - it's powerful. By the time we got to the first chorus I couldn’t sing anymore. It was all I could do not to sob uncontrollably. That’s who I am – I am Yours! And that’s who you are, too. If you have received Jesus’ gift of salvation and call Him LORD, you are His. Because of His blood, we are blameless, forgiven, righteous and free. Free to walk the path our LORD and Savior has set before us. Free to serve Him through glorious, wonderful words. What an honor and a privilege. So when someone asks, “What do you do?,” please feel free to tell them you are a writer, as I will, let’s just always remember that writing is what we DO for the Lord, it’s not WHO we are. Live free in Jesus today! This is the ninth month of me writing about the authors who have influenced me as a writer. If you missed any previous posts, please return to them and read up on how these certain authors influenced me. There were C. S. Lewis, J. R. R. Tolkien, J. K. Rowling, Arthur Conan Doyle, Alexandre Dumas, Frances Hodgson Burnett, Steven James, and Robin Jones Gunn. This month, I will be discussing Dee Henderson. During high school, I worked at the Meijer grocery store in Avon, Indiana, which was right around the corner. It was fine for a high school student who needed to earn money, but when I graduated high school, I wanted a better job with higher pay. I wanted a job with more value for what I could see myself doing for a long time. I attended IUPUI downtown Indianapolis and earned the job at Light and Life Christian Bookstore. Unfortunately, the bookstore doesn’t exist anymore, but I worked there for two years. I still think of it as my favorite job. What was better than being surrounded by Christian employees who had a prayer time every morning before we opened and could talk about God to the customers? Another perk I loved was being able to borrow books. As soon as a book came out, the employees were allowed to check them out and read them, then return them to the shelf for customers to buy. I read a lot of Christian fiction at the time. Still do, but that’s beside the point. When I quit and moved to Terre Haute, Indiana with my husband and six month old son, who is thirteen now, my husband joked that he would be broke from all the books I would now have to go buy. Luck for him, I visited the local library, so no loss of income there. But as a child, I gravitated toward Nancy Drew books and the mystery collections of The Baby-sitter Club and Sweet Valley High and University. When I was reading books at the bookstore, I was introduced to Karen Kingsbury, a contemporary romance writer. I loved her books. Not her recent ones, but her first one we’re great. I was a true mystery and adventure girl, but the Christian genre didn’t have a lot of suspense authors at the time (it was only 2001), so it wasn’t that long ago. Yes, there was Frank Peretti, and I read all his books, but there really wasn’t much else. One evening, when I had to work the evening shift with a high school student, he sat behind the register and read The Protector by Dee Henderson. I asked him what the book was about. He handed me the book and allowed me to read the back. I couldn’t believe it. A suspense book. For the next couple of days, I couldn’t wait to borrow those books, which I did and loved. I read everything Dee Henderson had written up to that point. By reading Henderson, I started to find more suspense authors, Terri Blackstock, Kathy Herman, DiAnn Mills, Brandilyn Collins, Colleen Coble. I still read and love this genre a lot. 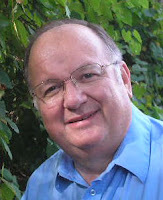 Dee Henderson taught me the love of Christian suspense, mysteries, and thrillers. Without her, I would not have been introduced to the genre, and I thank her for that. What author defines the genre you read and/or write in? How did you become introduced to the book? Thank you, Rick, for taking the time to chat with me in the realm of cyberspace. Your welcome...glad to be here. 1.) 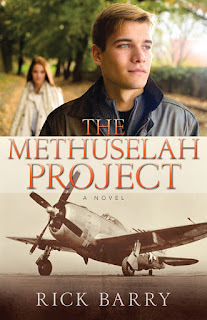 When did your first get the idea for The Methuselah Project? That’s honestly hard to answer. The initial ideas began forming back about 2008. I wanted a character from the past who ends up in our time, but still looking young. Plus, I wanted a good dose of romance. Yet, I didn’t want time machines, or space ships, or any such devices. The solution I developed was a secret German experiment. So there’s a light sci-fi thread, but the novel overall would be categorized as suspense rather than sci-fi. 2.) What has been the most frustrating experience in writing this book? First, trying to land an agent. That’s always the first hurdle in today’s publishing environment. Second, waiting for a publisher to take an interest. But in His time, the Lord sent me both an agent and a publisher—Kregel—who loved this story as much as I do. 3.) How many major rewrites did you do on TMP? More than I can count! Part of my writing style is to revise and polish the previous chapters before adding new words. So each chapter received automatic revising this way. Then Kregel assigned three editors to go over the manuscript, each one combing the pages in search of stray errors or for ways to enhance the story. 4.) I see that this book is also available as an ebook on different reading engines? Any comments on that? Yes, there’s an ebook version. In fact, a clerk at our post office told me she had downloaded it as an ebook and enjoyed reading a customer’s book via her telephone. I was pleasantly surprised! Paper books are not extinct by a long shot, but it’s crucial to have ebook formats too. 5.) Did you have anything to say about the cover, blurbs on the back? I have nothing but praise for the work of Sarah Slattery, Kregel’s graphic artist who designed the cover. Countless readers tell me how much they like the mix of the current-day guy and girl and a WW 2 fighter plane. It’s different, even intriguing. 6.) The endorsements are extremely well thought out and glowing by the contributors. Each of those endorsers wrote what they felt. I’m just pleased that they enjoyed the story so much. If they hadn’t, I’m sure none of them would have submitted comments to the publisher. 7.) How have you gone about self promoting the book? Kregel Publications has been coordinating a blog tour for the book. That is, they offer one free copy of the book to online reviewers in exchange for an honest opinion. To beef up the number of bloggers, I’ve also hired a PR firm to arrange even more reviews. Of course, the hope is that reviewers who don’t like this sort of fiction will not volunteer to review it. But there is no obligation to like the story. Each blogger is free to express their true opinions. So far, I’ve thanked the Lord for the positive responses I’ve seen. 8.) How did the journey from start to finish on this book project differ from your previous ventures? It was a longer journey from start to finish. I believed in Roger Greene and his story, but I realized up front it was a bit different. Each publisher knows what works for their company, and they tend not to stray from tried-and-true genres. My mix of suspense, romance, and a tinge of sci-fi must have caused some editors to shake their heads as a risk. But I’m thrilled the editors at Kregel loved it enough to give it a shot. Many readers are glad they did. 9.) If you had to do it all over again, what would you do differently? Many plot elements had to be figured out step by step. It was somewhat a process of discovery. I’m not sure what I could do differently, but the story is close to my heart, so I would definitely write it all over again. Definitely. It’s not contracted, but that’s the plan. 11.) I understand you've been building a new author website with more information about you and your books. Where can we find it? 11.) Thank you so much for taking the time to interview for Hoosier Ink. Thank you for taking time to interview me! I also want to thank my wife, Pam, to whom the book is dedicated. She has been a steadfast believer in me and this story, which she says is my best yet. Pam has been very patient with my many hours at the computer. Occasionally novelists whose work I'm editing seem to feel they should be apologetic when I catch a mistake they missed: a time line a bit off, a character name switch, the fact that it is snowing in August. Okay, that last one has never happened, but sometimes characters don’t seem to own coats in January in the Midwest, and that’s the exact same thing, isn’t it? 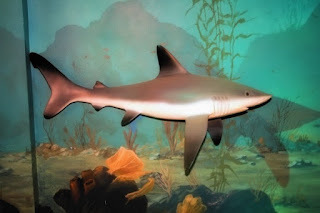 This makes me feel a little bit as though they think the editing waters could be shark-infested, and I could be one of the poised-to-strike sharks when I see a little blood, even though I am pretty sure I have never been shark-like at all. But you know what? I get it. I don’t like to make mistakes, and I especially hate for anybody to see them, lest I be judged. Maybe it's also the perfectionist firstborn thing. I doubt all novelists are firstborns, but they are writers who want to get it right. So I’m composing a little letter to all the novelists who have ever cringed because their editors found—or might find—errors. 1. You make errors—even with all your self-editing—because you are human. If you weren’t, you would be no fun to work with. Nope, no fun at all. We rather like the "treasure" hunt, even though only we would think of mistakes as some sort of the-glass-is-not-yet-full positive. 2. Mistakes don’t water down your story and message for editors. Those precious diamonds, even if they are still a little rough, shine through. 3. Every time you rewrite, every time you make a change, an error can be introduced and missed. But so what? You work hard to improve your story for the sake of your readers’ experience. That’s a good and admirable thing. You don’t just phone it in with a first draft. 4. Mistakes found in editing are no indicator of future sales. Really, they’re not. Really. There. If you have ever been afraid to be edited—or you dread it every time—now you know. The editing waters are safe. No sharks allowed. 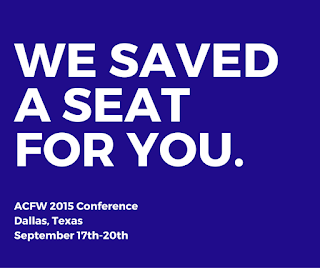 It's almost time for ACFW Conference 2015 in Dallas, Texas! 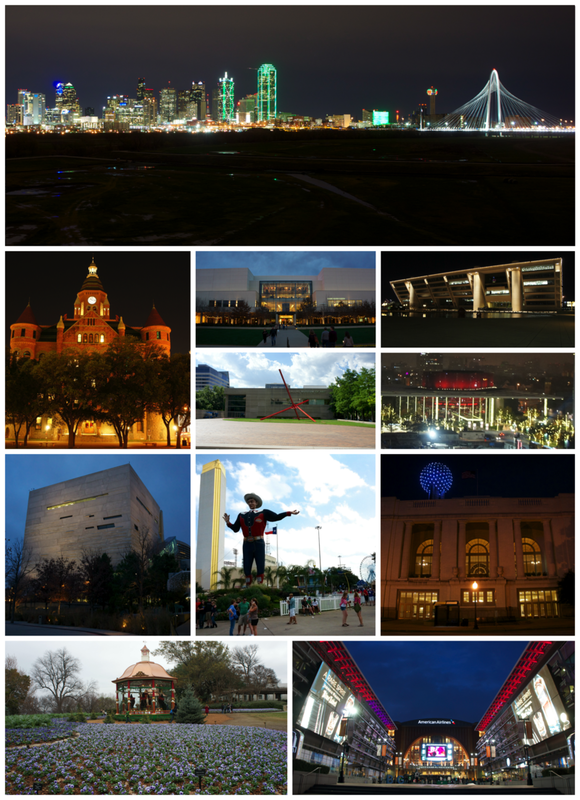 I'm very excited to get to be in Dallas next week for the ACFW National Writer's Conference! When you get there, if you see me, please say hello. I'll be helping at the registration table and greeting during meal times. It might sound crazy, but one of my favorite things to do at conference is to volunteer. I get to meet so many new people. What? Okay, okay, fine. My real picture's at the bottom of this post in case you don't know who I am. If it's your first time going to this conference or any other, I highly recommend the same resource I used the first time I attended a writer's conference: The Writer's Conference Survival Guide. I still use it to help me brush up on the basics. I can't remember everything, you know? Volunteer. If you volunteer the focus is off of yourself and on helping others. Nothing puts me more at ease than helping folks. Pace yourself. The world will not come to an end if you need to take a break from a session and take a nap in your room. I struggle with a chronic illness, and I know when I'm in need of a 20-minute snooze. I am learning to pay better attention to my body. I'm only hurting myself if I don't. Keep water and a protein snack with you. It'll keep you awake during long sessions. It'll also keep your tummy from rumbling and your blood sugar stable. Who can concentrate when they're hungry and sleepy? Bring something to take notes with, whether it's your phone, tablet, laptop or an old-fashioned pen and notebook. You're going to want to take notes. Trust me. Consider buying the recordings of the sessions. They are worth every single penny. I promise. I learn so much from them, and often they are timeless. You can listen to them three years later and still learn a lot because it's impossible to learn everything at once. Wear comfy shoes and clothes. You'll do a lot of walking and standing and waiting. If your stamina isn't good, you may consider bringing a walker to sit on if you need it because you will wait in lines sometimes for a long time. Dress in layers if you can. Air conditioning can be freezing but then, if you walk outside to lunch somewhere, it can be stifling hot in Dallas in September! There are also a lot of websites or blogs that you can google that will help you know what to expect at a writer's conference and how to get the most out of one. 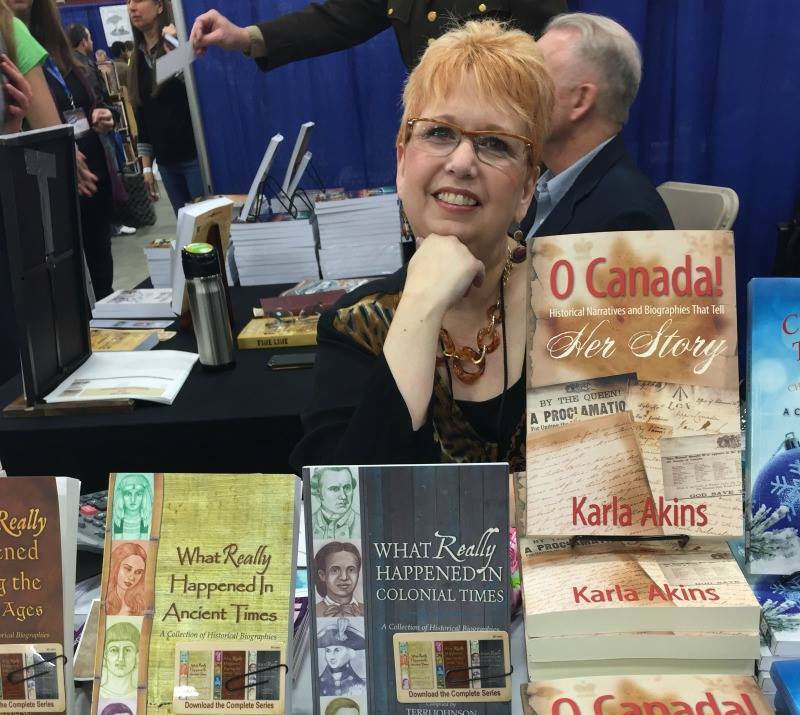 Fellow Hoosier, ACFW Board Member and best-selling author, Cara Putnam, has a post here: Preparing for ACFW & Other Writers Conferences. And Susan May Warren has one here: Four Things to Do to Prepare for the ACFW Conference. There are many other things you'll want to consider, and that's why I highly recommend The Writer's Conference Survival Guide. The author has no idea I'm recommending this, and I get no benefit from doing so other than the joy of knowing you'll be well-prepared. If you're not going to conference, please leave me a message and I'll be glad to answer any questions you may have about the experience. 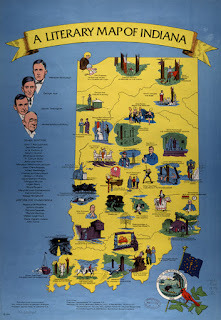 To celebrate Indiana's bicentennial next year, the Indiana State Library is preparing a new literary map of the state. The map will list 200 state authors (in honor of our 200th birthday!) with interesting facts about their life and work. 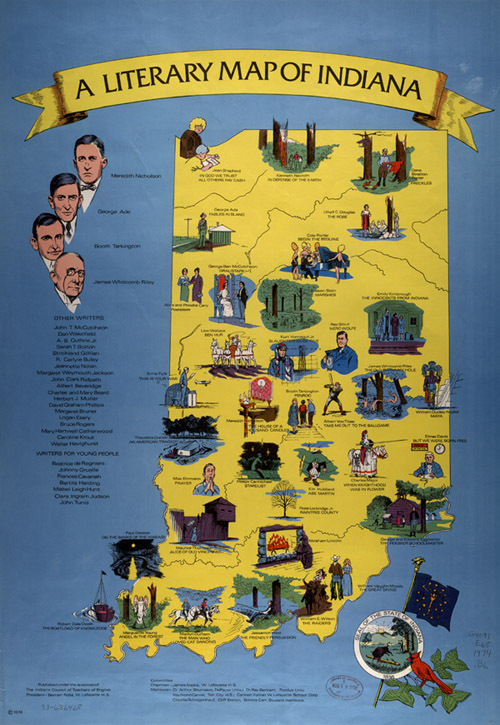 The state's current literary map (shown here) was published more than 40 years ago, and a lot of new authors have appeared on the scene since then. I wonder, Which Christian authors would you nominate for this honor? Wabash College's 3-volume reference set, Indiana Authors and Their Books, lists more than seven thousand Hoosier authors. The most recent edition was published in 1981, so it's due to be updated as well. Again, which Christian authors (living or dead) do you think should be listed there? Our place of origin influences the way we write. Curt Vonnegut said in an interview, "The writing style which is most natural for you is bound to echo the speech you heard as a child...I myself grew up in Indianapolis, where common speech sounds like a band saw cutting galvanized tin, and employs a vocabulary as unornamental as a monkey wrench." If that abrasive working-class dialogue ever surfaces in the stories you write, don't worry. It's natural because you're a Hoosier author. As the psalmist said, we have "a wonderful inheritance!" 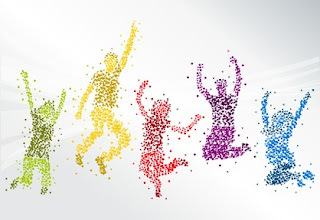 (Ps 16:6) Let's be familiar with it--and celebrate our part of it! A red herring is a distraction from the relevant, a misleading clue which ratchets up the suspense and keeps us guessing. 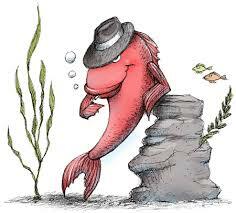 Frankly, it’s hard to surprise others so a successful red herring is a delight that adds depth to a story. For example, think of when you realized the truth in “Sixth Sense”. Bet you didn’t see it coming. I didn’t and I usually have it the plot line figured out. 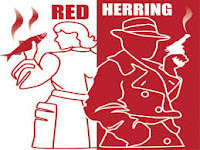 Genres that rely on red herrings are mysteries, suspense, and thrillers. For instance, perhaps the guy we think is evil isn’t so bad and the one we thought was good suddenly shows his true devilish bent. (Gasp!) This throws the hero deeper into danger. 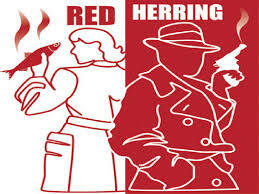 Red herrings are not just for mysteries. Recently I read a book entitled “Something Mis ing” by Matthew Dicks. A thief obtains long term clients, catalogs their lives, and takes for his personal use items they would never miss such as extra rolls of toilet paper, boxes of macaroni or unopened salad dressing that is about to expire. Of course, being a thief, he does take the occasional big ticket item like a never-used silver platter. Problems arise when his attachment and loyalty to his clients compel him to intervene in their lives. How does he stop a violent crime, protect his client, and maintain his anonymity? In this scenario Dicks drops a false clue that caused me to think I knew how our thief, Martin, is going to accomplish this noble deed. Then, it all goes sideways and much to my satisfaction, the problem is solved in a manner I never anticipated. 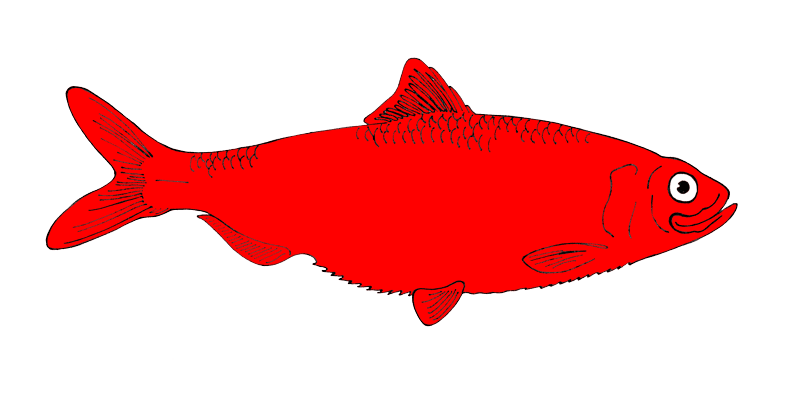 Red herrings are a bit of literary magic. In some formulaic stories, such as romance, red herrings are not much used. We want the boy to get the girl, but even then the twists and turns they take to that destination can afford opportunity for misdirection. Maybe she chooses the guy you wouldn’t pick. In a nice little historical, “A Promise for Ellie” a bride to be is rethinking her upcoming nuptials to the boy she’s always loved. 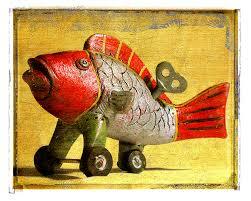 In this case, I thought I had the red herring by its sly little tail. Instead I picked the wrong guy. I should’ve seen it coming. and search the story to verify the facts. I hope my readers will enjoy it. 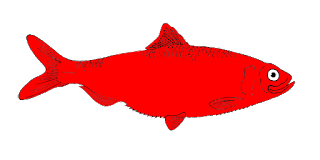 Red herrings are a bit of literary magic. Do you add them to your writing whatever your genre? What popular story held your favorite red herring? Perhaps an obscure story now stands out in your mind because of its ability to misdirect and thus surprise you. Tell me. I’d love to know it.